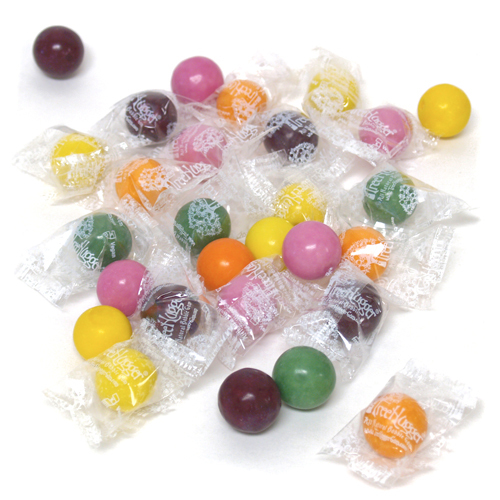 Individually wrapped natural jumbo gumballs. So fun! Tree Hugger natural gumballs are made with natural colors, natural falvors, and the addition of natural chicle from the Central American chicozapote tree, which is the orginal chewing gum! 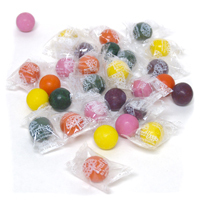 Citrus Berry includes Tangerine, Classic Bubble Gum, Orange, Lemon-Lime and Berry. Ingredients: Sugar, glucose, gum base (contains natural chicle), brown rice syrup, gum arabic, natural flavors (including lemon, grapefruit, orange, lime, tangerine), sunflower lecithin, natural colors (including red beet, beta carotene, chlorophyllin), carnauba wax. Additional information from the manufacturer: Facility does not process peanuts, tree nuts, egg, wheat or milk. Misc. info: Label states "NON-GMO"
Vegetarian info: Package states "Vegan". Approximately 75 gumballs per pound. Each gumball measures 3/4 inch diameter. This is really wonderful gum without the nasty ingredients. It does lose it's flavor quickly, but still, I would buy this over any other gum!